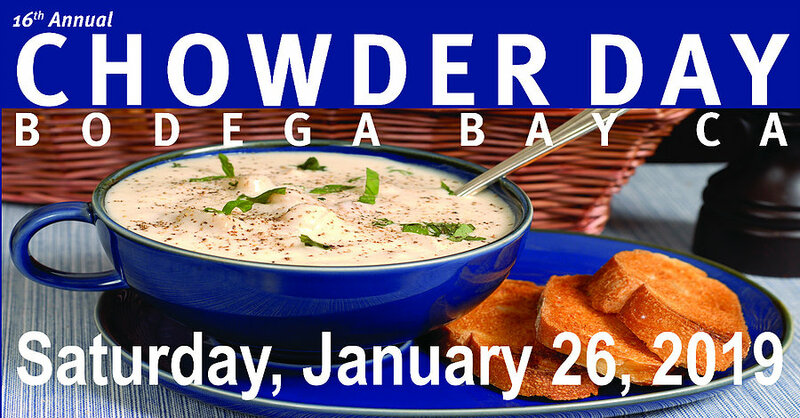 Join us for a fun day in the Bodega Bay Area sampling chowder at the numerous restaurants. You get to vote for the Best Chowder on the Sonoma Coast! This is a driving event around the towns allowing you to enjoy our beautiful area. It is not a walking event. This is a Fundraiser for the various charities of Bodega Bay including the Independence Day Fireworks show at Westside Park in Bodega Bay. ALL tickets must be purchased in advance. There will also be two starting times for tasting to help our guests enjoy all of the tastings offered. First time is at 10:00 am and the second is at noon. There will be 3 awards for best Chowder this year. People’s Choice, Critic’s Choice and Best Themed Tasting Venue. Where do I start my tasting? You may start at any of the restaurants for your tasting. Be sure to check your ticket as to whether you start at 10 or noon. How will I know which restaurants are participating? Look for the Chamber flags and sign at each restaurant. What if it the weather is poor? Rain or Shine, the tasting goes on! No refunds as this is a fundraiser! Yes! This year we are selling presale tickets starting December 1st. If you purchased the tasting to start at noon, do NOT begin tasting prior. No. You buy one presale ticket online for each person that wants to sample and vote. Print out your ticket and ballot to begin tasting. Why are there two different start times? In order to accommodate over Chowder Day visitors we are splitting our guests into two groups. We ask that you observe the start time on your ticket. That is not recommended. Not only would it take you a long time, it’s just not that safe to walk on Hwy 1. Some stops will have multiple locations. It’s best to drive around the area. NO! You can vote even if you don’t visit all the locations. We encourage you to vote no matter how many you taste. The formula we use for counting votes is not dependent on every person tasting every chowder. When you are done tasting, simply drop off your Ballot at the Visitor’s Center in Bodega Bay. Sure! You will be making a tour of the Sonoma Coast and Bodega Bay in your car. So feel free to bring your pet. Most of the stops you’ll make are outside. But keep in mind that some of the competitors set up at businesses that might not be pet friendly. You will receive your ballot via email 2 weeks prior to the event. Be sure to print one for each paying guest and bring with you. If you forgot to print, please stop by the Bodega Bay Visitor’s Center. The list will be provided shortly. Typically there are at least 12 restaurants particpating. Yes, it will be at the Bodega Bay Visitors Center, 913 Highway 1, Bodega Bay and will be clearly marked from the road. The Information Booth Staff will be able to answer any questions you may have. Where do I get my spoon? The participating restaurants will provide the spoon and the 2 oz taste. KEEP YOUR SPOON AS YOU ONLY GET ONE! Where do I pick up my coupons for local businesses in Bodega Bay? Each participating restaurant will have coupons available. You will need to present your ticket and ballot to receive them. What if I lose my ticket or do not have a printer? In this hopefully rare instance, come to the Information Booth at the Visitor Center and we will assist you. Each business will have parking available. There is no central spot to park and walk to each restaurant. Are there booths at one location, say under a tent, where this event takes place? No, it is at each restaurant around the Sonoma Coast and Bodega Bay area. They will be clearly marked with a flag.